Cutter and Buck DryTec Elliot Bay Polo Shirt Men's Cutter & Buck DryTec Elliot Bay Polo Shirt is a classic polo with a high performance fabric. 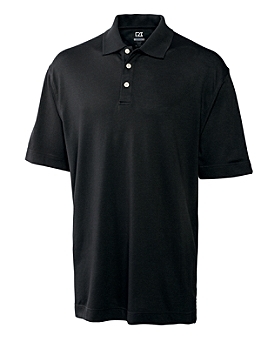 The moisture wicking piqué knit CB DryTec Elliott Bay Polo features a 1x1 rib collar, three-button placket, side vents, open sleeves, back half moon, logo buttons, and a C&B pennant on the left seam hem. 58% cotton, 42% polyester. Machine wash. Imported.